How can I set up tethering on my tablet? 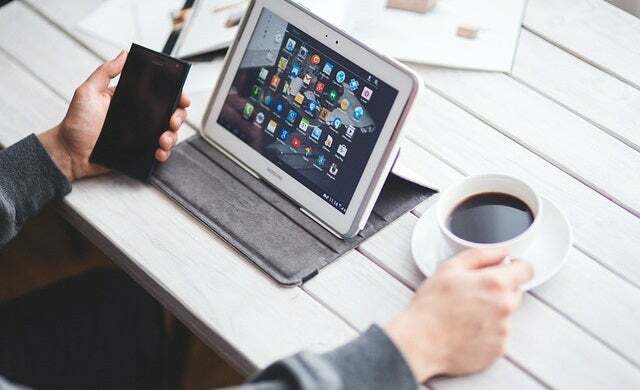 Tablets are an excellent productivity tool for the mobile business user, combining the portability of a smartphone with the size and versatility of a small laptop. But if your tablet doesn’t have a 3G or 4G connection of its own, having to rely on public WiFi to get online is far from ideal. Most tablets don’t have a full-size USB port on board, so you can’t plug in a USB dongle to get online either. The solution? Tethering. Quite simply, tethering means sharing your phone’s internet connection with other devices, including laptops, tablets and even other phones, so that they can use the phone’s 3G or 4G connection to get online. You can do so using WiFi, Bluetooth or USB, but WiFi is the most convenient as it lets more than one device connect to your phone simultaneously. Provided you don’t exceed your monthly data allowance, it won’t cost you anything extra. Aside from the convenience of not having to carry around any extra hardware, the ability to tether more than one device to your phone’s internet connection means you can get online using your tablet without your laptop using its connection, for example, or share your phone’s internet connection with friends or colleagues. Can any tablet get online via tethering? Yes. From your tablet’s point of view, tethering via WiFi is the same as connecting to any other WiFi network, so providing your tablet is WiFi-enabled – and all modern tablets are – by definition it supports tethering. Just make sure your tablet’s WiFi is switched on. To tether your tablet to your phone, you need to set up your phone up as a WiFi hotspot. The exact method for doing so depends on the phone, and the exact steps may vary slightly if your phone is running an older version of its operating system. But in general it should only take a few moments to get up and running. From your iPhone’s home screen, tap Settings followed by General, then tap Personal Hotspot. Flick the switch to the ‘On’ position, take note of the WiFi password and you’re all set. On your tablet, search for wireless networks, select your iPhone from the results that appear, then enter the password to connect. Open your Android phone’s settings menu, then tap More followed by Tethering & mobile hotspot. Flick the switch to activate your Mobile WiFi hotspot, then tap Set up WiFi hotspot. Take note of the network name, then tick the Show password box to reveal the password. On your tablet, make sure WiFi is switched on, then scan for networks and select your phone and enter the password to make the connection. To share your Windows Phone’s internet connection, swipe across the screen to the alphabetical apps list, then tap Settings. In the System applications list, tap Internet sharing, flick the switch to the On position then tap the Setup button at the bottom of the screen. Unlike on Android or iOS, Windows Phone prompts you to name the network and select a password yourself. Once you’ve done so, scan for your Windows Phone using WiFi, then connect using the details you’ve set. Setting your phone up as a mobile hotspot makes it visible as a wireless network to any WiFi-enabled device in range, but the only way to actually connect to it is by using the password, which is protected via encryption to keep it secure. Provided you don’t leave your password visible on screen, nobody will be able to connect to your phone without it.